This kandylaki is just outside of Ancient Olympia. 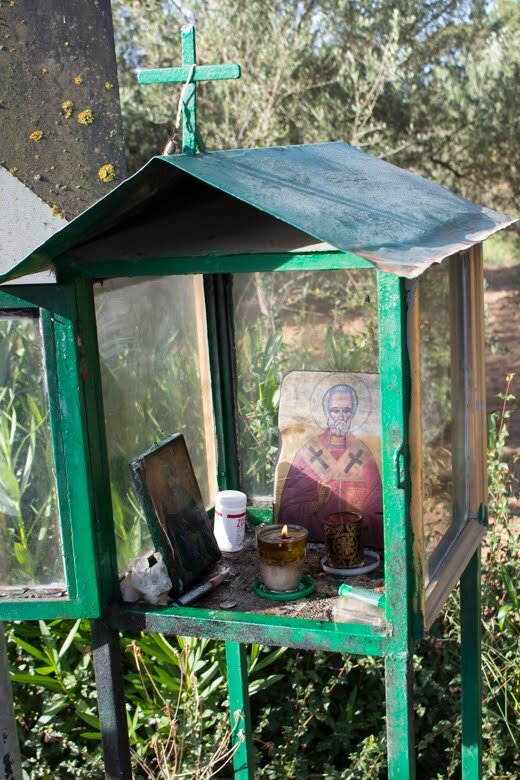 In Greece, if you have a minor accident, and you’re thankful that it wasn’t worse, you put up a little shrine out of thanks. If you have a big accident, you put up a shrine out of thanks that it wasn’t even worse. If someone was killed in your accident, you still put up a shrine, but you put a picture of the person killed inside, so people know who to pray for. The kandylakia were always lovely, so decorative and personal, but it’s the olive oil lamp, or vigil lamp, that most caught my fancy. These lamps are simply made out of everyday materials, but play a deeply meaningful role in the lives of Orthodox families. 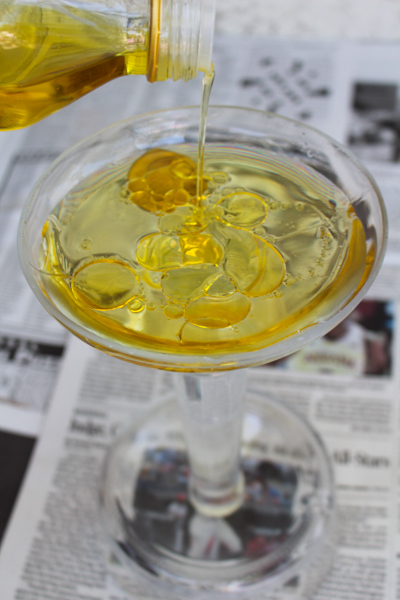 The light from these lamps is clear and bright, and the oil that they burn is wholesome, natural olive oil. Grandparents dip their fingers into the warm oil of a burning lamp and use that oil to bless their grandchildren. wide-mouth Mason jar. 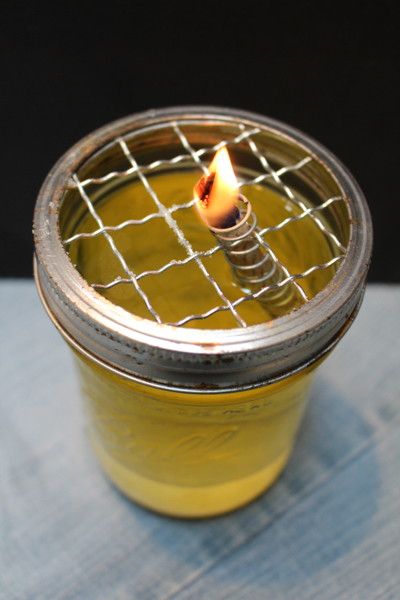 For the particular lamp in this tutorial, I used a pint-sized wide-mouthed Mason jar. 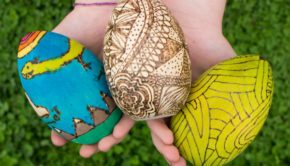 You can use any thrifted or upcycled glass dish or jar, even cutting one to size to better suit your needs. Just keep in mind that you’ll need to alter the tutorial accordingly. This lamp is made from a glass bourbon bottle that I cut in half and glued back together upside-down. 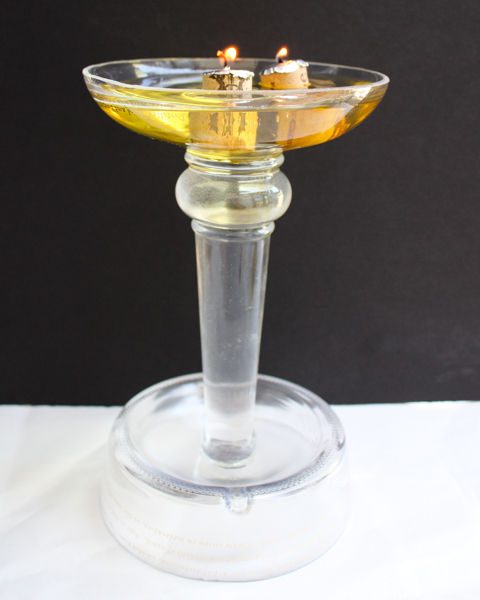 The wicks are candle wicks pushed through cork topped with aluminum foil, and they float on top of the oil. They’re lovely, and the lamp works well, but you can see how small the flames are. Want a larger flame? 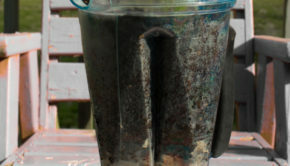 Get creative with thicker wicking! For the olive oil lamp in this tutorial, I’m using a length of cotton rope that’s about 1/2″ diameter. It puts out a nice, big flame! metal coil from a spiral-bound notebook. Use a coil that’s approximately the same diameter as your cotton rope. metal ring that fits the Mason jar, and a circle of chicken wire to fit the ring or a frog lid insert. I use these frog lid inserts to make bouquets in Mason jars, and they also work perfectly for this oil lamp. If you don’t have a lid insert like this, then you can cut any open-mesh wiring or hardware cloth to fit inside the metal ring. olive oil. Any food-grade olive oil will work well for this. salt and water. These aren’t necessary, but if you fill up most of the lamp with salt and water, you’ll be able to use less oil. Ignore the fact that I’m using a different container here, but do notice that you can just pour in the oil–it will separate to the top all on its own. By the same reasoning, you can add more water and salt whenever you’d like, and they’ll naturally fall to the bottom of the lamp. 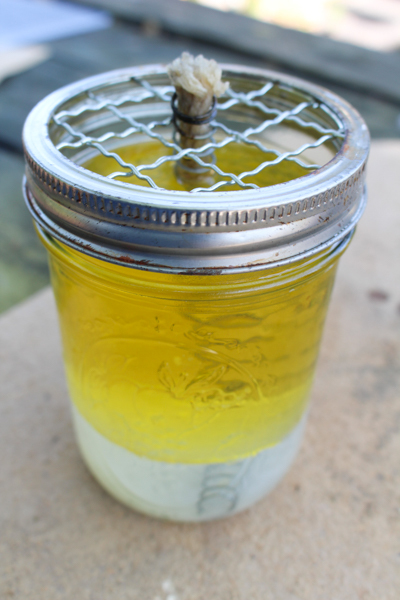 When you’re not using your olive oil lamp, you can put a lid on the Mason jar to keep the ingredients fresh. 2. Add the metal ring. 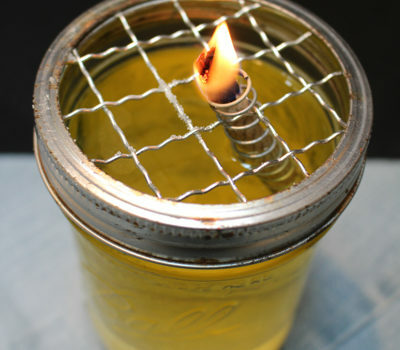 Place the frog lid or the circle of chicken wire over the top of the Mason jar, and screw on the metal ring. The metal ring will hold your wire in place. 3. Light the flame! The flame will last for a long time, burning cleanly and without suet. 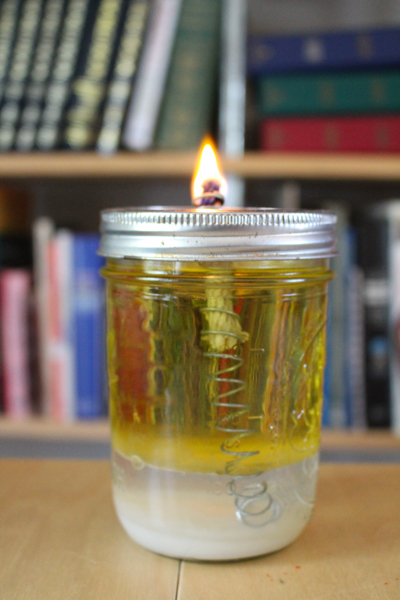 You can pull up more of the wick or top off the olive oil as necessary. I have noticed that this cotton rope wick does smoke when I blow the lamp out–it smokes a LOT, and it doesn’t really want to go out. 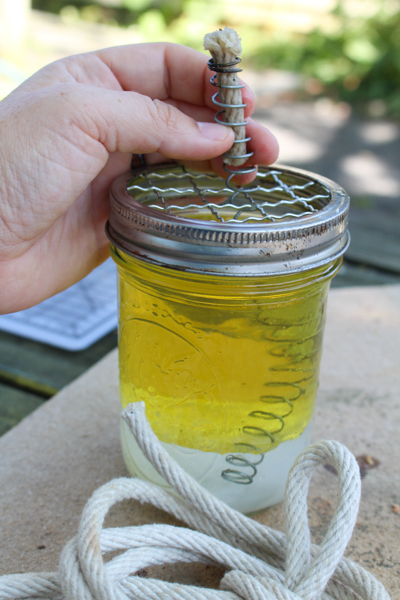 An easy solution is to unhook the coil and submerge the entire wick in the oil. Unlike kerosene, olive oil will simply smother the flame, not catch the whole thing on fire and blow up your house. And that’s another reason why I prefer olive oil lamps! These are pretty cool! I’ll have to give it a try. But, although I do understand the water will take up some of the room so you don’t have to use as much olive oil, what is the purpose of the salt? I actually don’t think that there is a physical purpose for the salt; it’s what they use in the vigil lamps in those little Greek shrines, so it might have religious significance. I do think that the salt is useful for adding a little more weight to the bottom of the lamp, and I think it looks pretty.